In physics, it is useful to know as precisely as possible how friction phenomena arise—and not only on the macroscopic scale, as in mechanical engineering, but also on the microscopic scale, in areas such as biology and nanotechnology. It is quite difficult to study friction at the atom scale where non-linear effects prevail. Scientists from the QUEST Institute at the Physikalisch-Technische Bundesanstalt (PTB) have now presented a model system that allows the investigation of atomic-scale friction effects and friction dynamics that are similar to those taking place in proteins, DNA strands and other deformable nanocontacts. This model system consists of laser-cooled ions that arrange themselves in Coulomb crystals. The researchers have carried out experiments and numerical simulations and obtained new fundamental findings on friction processes in these atomic systems. They have now presented their results in the scientific journal Nature Communications. Most macroscopic objects have a rough texture from an atomic view point. Even if they feel smooth to the touch, they exhibit asperities. Strictly speaking, two objects never lie directly on top of each other, but only touch each other at these asperities. The atomic lattice structure therefore plays no role in this interaction. This is quite different for objects on the atomic scale, like nanomachines or biomolecules. "Here, atomically smooth surfaces touch each other. The surface therefore also plays a role and must be taken into account in model calculations," explains PTB physicist Tanja E. Mehlstäubler. "These models also explain fascinating phenomena such as superlubricity, where static friction becomes nearly nonexistent. It occurs when two crystalline surfaces are incommensurate to each other. This means that the ratio of the lattice spacings of the sliding surfaces is irrational. This leads to there being no place where the two surfaces are an exact match for each other." There are thus enough reasons to precisely measure friction at the nanoscale and to investigate its dynamics. A powerful instrument already exists for measuring friction, the friction force microscope. "Direct experimental access to the dynamics of a friction system is nearly impossible. Model systems in which the atoms are easily controlled—both temporally and spatially— are therefore indispensable. This allows us to investigate them," explains Mehlstäubler. Such a system has now been presented by the scientists from PTB, together with their partners from Sydney. 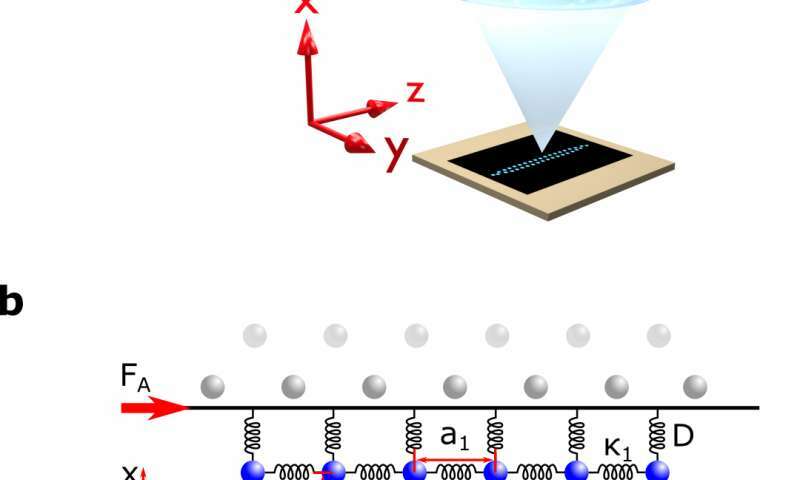 Ytterbium ions kept in an ion trap are cooled by means of lasers to such an extent (down to a few millikelvins) that they form a crystal consisting of two chains. The ions arrange themselves in such a way that the nearest neighbor is always as far away as possible. This structure is called a zigzag. Two such ion chains are a very accurate representation of the two partners of a friction process—and they are easy to observe very precisely. When ytterbium ions are irradiated with light whose frequency is close to their resonant frequency, they begin to fluoresce. "We are thus able to observe the individual atomic particles in their motion through our imaging optics," adds Jan Kiethe, a physicist at PTB and the main author of the study. A transition between two different phases, which was caused by the presence of a structural lattice defect, has been observed and analyzed here. In one of the regimes, static friction is the main actor in the transport dynamics; in the other regime, it is sliding friction. The dynamics of the ion chains are comparable to those of molecule chains like DNA. In their study, the scientists have created a physical model system to investigate the complex dynamics of friction in 1-D, 2-D and 3-D systems with atomic precision. Moreover, this model system has paved the way for the investigation of transport phenomena in the quantum regime.